Here is a series of questions women frequently ask about uterine fibroid embolization and fibroids. The answers should not be considered medical advice but they do represent the typical experience of our own patients. Always speak to your own health care professional concerning your unique case. What kind of fibroids can you embolize? Can the plastic particles used in embolization leak or cause any damage to other parts of the body? How fast does embolization work? Are some people allergic to the things they put into you when they embolize you? Are some fibroids too big to be embolized? Will embolization keep new fibroids from forming? Why don’t I need to be in a hospital for embolization? Is there a right age for embolization? What are some of the reasons I wouldn’t be a candidate for embolization? How long have you been performing embolization for control of heavy bleeding? Why doesn’t my doctor perform embolization? How soon after embolization can I resume attempts to become pregnant? Is embolization covered by my insurance? How expensive is embolization compared to other procedures? Can the FTC perform my embolization even if I live outside Los Angeles, California? I have several fibroids, one that is said to be pedunculated, outside of my uterus…Can these type of fibroids be treated with UFE? All sizes of fibroids have been successfully embolized. The shrinkage will be felt more in fibroids smaller than a 5 – month sized pregnancy. The embolization process affects all fibroids within the uterus wherever they are located. Plastic particles are injected into the artery supplying the fibroids. They are carried under pressure from the heart into smaller arteries where they lodge. Non-target embolization, a condition when some particles inadvertently flow into other parts of the body, may occur in extremely rare cases. Fibroids begin to shrink immediately. Improvement in bleeding is immediate, and shrinkage is reached 90% of total by six months after the procedure. Heavy bleeding from fibroids stops right away. Most patients experience cramping pain for one or two days after embolization. Many patients go home on the afternoon of their procedure. Some patients, especially those with larger fibroids experience a low-grade fever after embolization. Particles used for UFE have not caused an allergic reaction in any patient, in any part of the body in the 20 years they have been used. For embolization, no. This procedure is done under sedation, where the patient breathes on her own. Generally speaking, all sizes have been successfully embolized. The greatest success is with fibroids under the 5-month pregnancy size, but we’ve also successfully shrunk fibroids the size of cantaloupes. Recurrence after embolization has not occurred. This is one of its major advantages over myomectomy, where fibroids which have been surgically removed often grow back. First, you’ll be under local rather than general anesthetic. Second, nothing is cut open or removed from your body. Occasionally, we keep patients for observation, but most women return home the same day as the procedure. No. 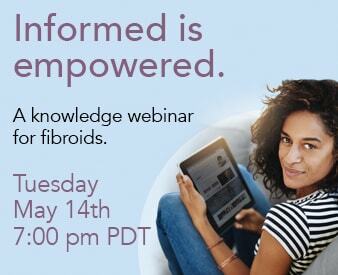 Fibroids affect women of all ages. The right time to do something about them is the moment they become a problem. Embolization is not a cure for cancer. Certain other diseases might be present causing symptoms similar to those caused by fibroids. We will screen you for these conditions. Embolization has been used to control hemorrhage (heavy bleeding) in many parts of the body, including the uterus for more than twenty years. Nothing is experimental about the procedure. Embolization has been approved by the FDA, and is covered by all public and private insurance plans. Members of the FTC began performing UFE in 1994. Since then, we have treated thousands of women. Worldwide, UFE has been performed nearly a million times. The procedure requires specific training in radiology as well as gynecology. Many physicians do not have the capacity to combine the two disciplines in their practice. Women have conceived after embolization. In fact we know of no patient who could become pregnant before embolization who could not after this procedure. Women have successfully carried babies to term after embolization. Ask your doctor about the risks to fertility associated with major surgery such as myomectomy before deciding upon embolization. We advise you to wait 6 months after embolization before attempting to become pregnant. There are so many insurance plans, that it is impossible to answer such a question without evaluating your benefits. However, embolization is a benefit offered by almost every plan with which we have spoken. Insurance plans vary. Nonetheless, embolization is usually less expensive. There is no long hospital stay. Yes. Many women travel from outside California to take advantage of the continuity of care provided by Dr. Bruce McLucas and his medical team for fibroid embolization. In fact, Dr. McLucas is the only OBGYN that performs this procedure. We’ve had patients from as far away as New York or Philadelphia and from countries such as Mexico, Nigeria, and Kuwait. We can assist you to make travel arrangements and have assembled a list of resources to help with travel and accommodations. Visit our Concierge Page for futher details. Yes. Many types of fibroids can be treated with UAE, because the procedure involves blocking the blood supply to the fibroid, rather than cutting it out. Your symptoms will go away with little recovery time necessary.